National Gallery of Art, Washington;	Gift of the Bay Foundation in memory of Josephine Bay Paul and Ambassador Charles Ulrick Bay. Exhibited at the Salon of 1787 - it is clearly discernible above the door in Martini's engraving of the exhibition room - the painting was conceived as a tribute to friendship and to maternal love. It was singled out and extolled for the brilliancy of its technique (the shimmering silks, the subtly flesh tones) and the intensity of the	motherly and filial affection expressed in the poses of the Marquise de Rouge	and her children. One writer compared it to the artist's alreadv famous portrait of herself holding her daughter of 1786 (fig. 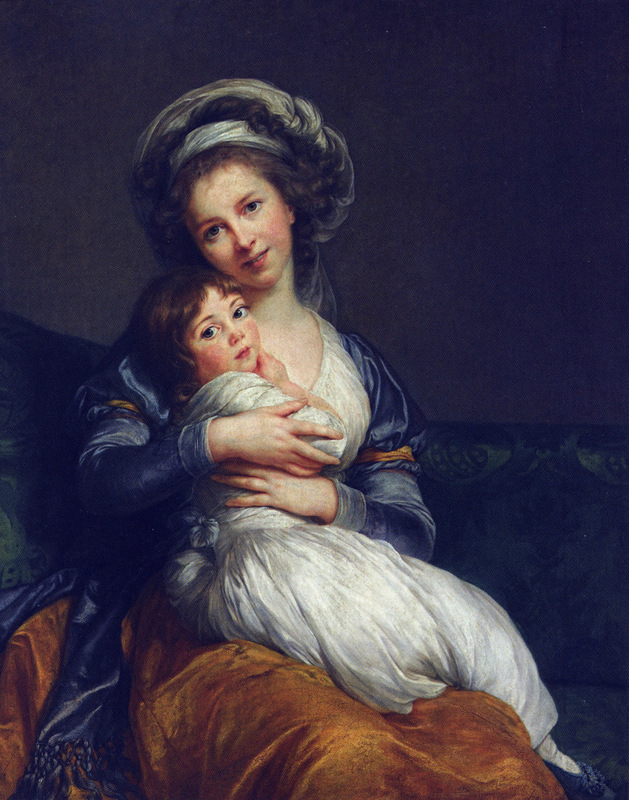 24): "Madame Le Brun, by	painting herself holding her child her arms, shows how beauty and talent are enhanced when they are allied to the tenderest and most delightful affections. The same feeling is present	with added interest in the painting depicting the Marquise de Peze and Marquise de Rouget [sic] surrounded by her children. Thus Art can serve mankind better than demonstrations of a moralist." (L'Ami des artistes au Salon, cited below). In this, one of Vigee Le Brun's true masterpieces, the composition is loosely based on certain Holy Families of the Italian High Renaissance. The	costumes, especially the turbans worn by the two women, are reminiscent of	sibyls and female saints in the works of Guido Reni and Domenichino. 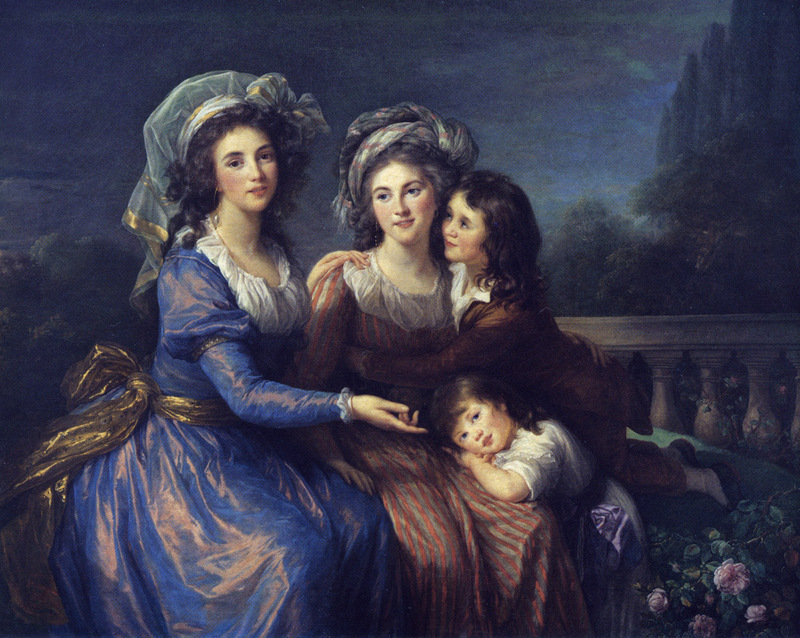 Perhaps because it was not publicly shown after 1787, this quadruple portrait does not seem to have inspired interpretations by other artists, with the possible exception of Louis Leopold Boilly, who employed a similar scheme in his portrait of a mother and her two children in a landscape (sold in Paris, Palais Galliera, December 14, 1960, lot 1). Mme Le Brun's own portrait of Countess Catherine Sergueevna Samoiloff and Her Children, painted in Saint Petersburg in 1797 and now in the Hermitage, Leningrad, owes much to the portrait shown here (for an illustration, see L. Nikolenko, 1967, p.102, no. 8). Caroline de Murat -not to be confused with Napoleon's sister - was the widow of Alexandre Frederic Jacques Masson, Marquis de Pezay (also spelled Peze and Pezai in the eighteenth century). The latter was a libertine, a poet of sorts, and a courtier expert in political intrigue. Born a commoner, he invented his title of Marquis. He had been advisor to his god-father, the old Comte de Maurepas, Louis XVI's first Prime Minister, and to the Minister of War, the Prince de Montbarrey (Mme de Montbarrey was Pezay's mistress). For a while he even kept up a secret correspondence with the King himself. Much of his success was due to the maneuverings of his sister, Mme de Cassini, the mistress of the Marechal de Maillebois, thanks to whom he had entered the army with an officer's rank. It was Pezay who had the future Controller General, Jacques Necker, appointed to the Finance Ministry, and he was in large part responsible for the dismissal of Turgot. Exasperated by his ceaseless plotting, Maurepas finally had him removed to the provinces, where he was given the Inspection of the Places Maritimes, a post he soon lost because of mismanagement. He retired to his estate near Blois and died soon thereafter, in 1777, leaving his young and attractive widow childless. Except for the fact that she frequented the salon of Vigee Le Brun during the 1780s, almost nothing is known of the Marquise de Pezay. The Comte d'Espinchal described her as "of good family, and as beautiful as an angel" (Joseph Thomas, Comte d'Espinchal, Journal d'emigration, Paris, 1912, p. 42). Her closest friend was Natalie Victurnienne, Marquise de Rouge, the daughter of the Duc de Mortemart. She also had been widowed by the time this portrait was painted. In 1777, she married Bonabes Alexis, Marquis de Rouge, who died five years later while returning from the West Indies on board the battleship Zele. The two sons she had by Rouge, and who are portrayed beside her, were named Alexis Bonabes Louis Victurnien (1778-1838) and Adrien (1782-1861). In 1789, only three days after the fall of the Bastille, Mme de Rouge and her sons left France for Switzerland; they returned the following year and lived in seclusion with her husband's aunt, the Duchesse d'Elbeuf, at the Chateau de Moreuil. In 1791, she, her children, her mother, and Mme de Pezay emigrated to Germany, settling first in Heidelberg. D'Espinchal encountered them there and noted in his journal: "I have found living here since the winter, the Duchesse de Mortemart, mother of the Duc and of the Marquis de Mortemart, both of whom are deputies to the Estates-General ... and both members of the majority of the conservative nobility. The Marquise deRouge, their sister, a pretty and amiable widow, is here with her children (she looks more like their sister) ... and Mme de Pezay ... who is her intimate friend" (pp. 242-243). In 1796, the Marquise de Rouge moved to Neustadt, near Vienna, where Adrien was admitted to the military academy. She lived in Altoona and Munster before returning to Paris in 1798. As her lands had been expropriated and sold, at first she had to take room and board in a home run by former nuns. Her sons joined her in France in 1800. She died on December 25, 1828. In 1794, her elder son entered the service of Austria as aide-de-camp to the Prince von Waldeck. The same year he joined the Mortemart regiment of the French imigri army. In 1804, hemarried Ce1estine de Crussol d'Uzes. With the restoration of the Bourbons, he was appointed Adjutant-Major of the King's Swiss Guards, and he received the cross of the military order of Saint Louis. During the Hundred Days, he followed Louis XVIII into exile; as a reward, he was later promoted to the rank of Lieutenant Commander of the French Column of the Royal Swiss. In 1815, he was raised to the Hereditary Peerage with the title of Marquis. He refused to swear allegiance to Louis Philippe and resigned his commission in 1830. He died on March 30, 1838, at the age of sixty. The father of six children, he founded the elder branch of theRouge family. His brother, Adrien, born on July 2, 1782, also had a distinguished military career. He served under the Comte d'Artois in the Army of the Princes, first as a second lieutenant in the Infantry, then in 1800 as a "chasseur noble" in the Mortemart regiment. From 1815 to 1823, he was a member of the Chamber of Deputies, representing the Departement of the Somme. In 1816, Charles X appointed him to the Peerage with the title of Comte. For a time he commanded one of the four subdivisions of the army stationed in Paris. He too refused his allegiance to the government of Louis Philippe. By his wife, Caroline de Forbin, he had four children, and from him descends the younger branch of the the Rouge family in which the National Gallery's portrait remained until 1960. According to a tradition kept alive in the Rouge family, Mmes de Pezay and de Rouge bitterly quarreled while in exile. The Marquise de Rouge wanted to cut her former friend's portrait out of the picture but was fortunately prevented from doing so because of the position of Mme de Pezay's right hand. The following anonymously painted related works have been traced: 1) copy of the entire portrait, in the collection of Comte Jean de Miramon-Pesteils, Chdteau de Pesteils, Vic-sur-Cere; 2) copy in the collection of the Rouge family; 3) bust-length oval copy of the portrait of the Marquise de Pezay, recently in the Balch collection, Cincinnati; 4) portrait of Mme de Pezav, formerly in the Fauqueux collection; 5) oval portrait said to be of the Marquise de Rouge in collection of Sarah Wells-Robertson, New York; 6) so-called portrait of the Marquise de Rouge in riding costume, formerly in collection of Walter B. Chrysler, Jr., last sold, in London, Christie's, December 16, 1978, lot 211. PROVENANCE: Collection of the Marquise de Rouge, Paris, Chdteau de la Belliere (Anjou) and Chateau de Moreuil; to her son, Comte Adrien de Rouge; to his son Armel, Comte de Rouge; to his son Fernand, Comte de Rouge; to his son Jean, Comte de Rouge (1880-1960); to his nephew Charles Edouard de Miramon-Pesteils (son of Marie Therese de Rouge, Comtesse de Miramon and sister of Jean de Rouge); Wildenstein, New York, 1961; acquired in 1965 by the Bay Foundation and offered to the National Gallery of Art in memory of Josephine Bay Paul and Ambassador Charles Ulrick Bay. EXHIBITIONS: Paris, Salon, 1787, no.98; Cleveland Museum of Art, Style, Truth and the Portrait, (cat. by R.Saisselin), no. 67, illus. ; Washington, National Gallery, The Eye of Jefferson,June 5-September 6, 1976, no. 261, illus. SELECTED REFERENCES: Salon criticism of 1787, anthologized inCollection Deloynes (Paris, Bibliotheque National, Cabinet des Estampes), XV:No. 374 - Les Grandes propheties du Grand Nostradamus..., Paris, 1787, p, 25; No. 379 - L'Ami des artistes au Sallon, Paris, 1787, p. 35; No. 402 - "Discours des Morts sur les tableaux exposes en 1787," journal General de France, p. 938. Other Salon criticism, Comte Stanislas Koska Potocki, Lettre d'un stranger sur le Sallon de 1787, Paris, 1787, pp. 17-18. M.L.D. Mastai, "The Group Portrait," Connoisseur, CLXI, April 1966, p. 277, illus. ; J. Walker, National Gallery of Art - Washington, New York, 1975, p. 343, no. 466, illus. (color); Baillio, May 1981, pp. 59, 9., notes 28-29, illus. P. 57, fig. 8 (color).